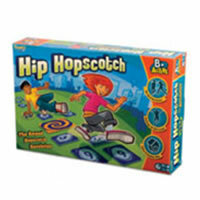 Hip Hopscotch is the ultimate Hop Scotch game mixed with Twister. No two games are ever the same since players can change the course after jumping and can also add different movements. If you're up for 360 moves and touching the ground testing your flexibility then Hip Hopscotch is for you. Hip Hopscotch can be played with only one person and up. Take the original game of Hop Scotch to the next level and play Hip Hopscotch today. Hip Hopscotch will come with 20 numbered hop pads, 1 double hop pad, 1 round hop pad and the Hip Hopscotch game rules and instructions. Please keep in mind that the official Hip Hopscotch childrens rules and instructions could be different depending on the game version you have. The rules below are some of the exact directions on how to play Hip Hopscotch. Share with us your comments, funny stories, tips, advice, strategies, creative ways to play, questions about how to play, problems with the rules or anything you want about Hip Hopscotch. All submissions will be reviewed within 24 hours. Click here to add your Hip Hopscotch comments.